The quest to find the “Fittest on Earth” is upon us. The 2018 CrossFit Games is being held from August 1st – 5th in Madison, Wisconsin. The games will be broadcast on CBSSports.com, the CBS Sports app for streaming TV boxes, and the CBS Sports mobile app. Regardless of the platform you use, we will explain how you can watch the games from anywhere. The problem with trying to stream such an event online is that broadcasters usually place restrictions on which countries you can watch from, due to licensing issues. Indeed, CBS live streams are restricted to US users. Luckily, VPNs, or virtual private networks, can be used to bypass these geo-restrictions by spoofing your location. This means you can watch the CrossFit games from the UK, the US, Canada, Australia, France, Germany, or anywhere else abroad. In this post, we’ll explain how to use a VPN to watch the CrossFit Games and the best VPNs for the job. Download the required app for your device and log in. Connect to a server in the US. Try watching a live stream on the CBS Sports website or app. It should start without giving any error messages. It’s best to try this out before the coverage starts so you can iron out any issues. ExpressVPN is an excellent service for streaming, with 29 high-speed servers located in the US. This means that you can easily stream HD sports broadcasts such as the 2018 CrossFit Games with this service. ExpressVPN subscribers can also unblock Netflix, Sky Go, NBC, HBO Now, and more. Three connections are allowed at once which is great for users with multiple devices. This provider encrypts your internet connection using the 256-bit AES standard. DNS leak protection is also standard, as is IPv6 leak protection. A kill switch ensures that your private data isn’t leaked in the case of your VPN connection dropping out. ExpressVPN does keep minimal connection logs, but IP addresses are not stored. Customers can pay with bitcoin, which lends itself to more anonymous transactions as compared to traditional payment methods. The service also has a .onion site which allows for nearly completely anonymous registration. Setup is super simple but there is plenty of support documentation on the ExpressVPN website which can assist with any issues encountered with the service. 24/7 live chat support is also available if needed. ExpressVPN has MacOS, Windows, Linux, Android, and iOS apps. You can also manually configure supported routers. BEST VPN FOR CrossFit Games:ExpressVPN is our #1 choice. A blazing fast and reliable choice which unblocks all major streaming services including Hulu, Netflix and Amazon Prime. Great security and privacy features and keeps no logs. Try it risk-free with the 30-day money back guarantee. With over 1,700 US servers optimized for HD streaming, you can easily enjoy the games by connecting to a NordVPN server. Six devices are allowed to connect simultaneously per subscription, to the benefit of multi-device users. Services such as Netflix, Sky Sports, Comedy Central, and ABC iView can also be unblocked with this service. NordVPN does not keep logs of users’ connection data, and also offers further protection by using 256-bit AES encryption on internet traffic. A kill switch prevents data leaks. DNS and IPv6 leak protection are also standard with this provider. Bitcoin payments are supported, which means more anonymous transactions for potential subscribers. A large database of helpful tutorials and guides aids users who need help setting up and using the service. 24/7 live chat support is also offered, along with email support. You’ll find apps available for a large number of devices, including iOS, Android, Windows, and MacOS. NordVPN provides extensions for both Firefox and Chrome web browsers. Users can manually install the service on Linux devices and some routers. BEST BUDGET VPN:NordVPN is great value. A real contender in all categories, has strong security features and allows up to 6 devices to be used simultaneously from one account. Includes a 30-day money back guarantee. 200 blazing fast CyberGhost servers are available in the US. This means that in addition to streaming CrossFit Games live, CyberGhost users can also enjoy excellent streaming from services such as Netflix, Hulu, Comedy Central, and Showtime, without buffering issues. Seven devices can connect to the service at the same time. An automatic kill switch comes standard with this service which also boasts DNS and IPv6 leak protection. This provider has a no-logs policy and secures user connections with 256-bit AES encryption. CyberGhost accepts bitcoin payments for those seeking added anonymity. Comprehensive guides, troubleshooting pages, and FAQs offer help for customers who need information on a particular topic. Reliable 24/7 live chat support is also available. You can download apps for Windows, MacOS, iOS, and Android. The service supports Linux devices and routers, though these will need to be manually configured. BEGINNERS' CHOICE:CyberGhost is easy to use. Fast and reliable connections with a good range of servers. Great privacy with zero logs and DNS leak protection. Can’t match rivals with unblocking some popular streaming platforms. 45-day money back guarantee. PrivateVPN only offers 10 US servers but these are of high quality and support HD streaming without buffering. In addition to unblocking CBS Sports’ live streams, this service also unblocks platforms such as Netflix, Hulu, and Amazon Prime Video. Users get six simultaneous connections per subscription, which is great for multi-device use. 256-bit encryption secures your connection, along with IPv6 and DNS leak protection. A kill switch is also standard. This provider does not store connection logs. Bitcoin payments round out the primary anonymity features for users who want a highly secure streaming experience. PrivateVPN offers 24/7 live chat support and remote support for those who need extra help setting up the service or solving a problem. MacOS, iOS, Android, and Windows apps are available for users. Manual configuration is necessary for Linux and supported routers. GREAT SPEED:PrivateVPN is consistently reliable. Good for general purpose use and HD Streaming. Could do with having more servers and lacks 24/7 support. 30-day money back guarantee. IPVanish has over 400 US servers. Connect to one of these and you’ll be able to stream the 2018 CrossFit Games live. This provider can also unblock services such as Sling TV and HBO Now. IPVanish also blows the competition out of the water with its 10 simultaneous connections per account policy. IPVanish stores no logs and uses 256-bit encryption to protect users. As with the other options on our list, IPVanish has a no-logs policy. The service also incorporates a kill switch into its software to help prevent data leaks. That’s in addition to its IPv6 and DNS leak protection. You can also sign up using bitcoin to pay the subscription cost. Customer service is available through an email form. If you’re more of a do-it-yourself type, there’s a comprehensive knowledge database that allows users to search for and troubleshoot problems. You can download Android, iOS, Windows, and MacOS apps for IPVanish. This provider is one of a very few VPN services with a functioning Amazon Fire TV app. If you want whole-home coverage, IPVanish works on a select few routers, although manual setup is required there. UP TO 10 DEVICES:IPVanish has a large network of servers and handles multiple connections well. Easy to use and preferred by users who need high standards of privacy. Can’t unblock as many streaming services as some of its rivals. 7-day money-back guarantee. The games will commence on Wednesday, August 1, and conclude on Sunday, August 5. They will be held at the Alliant Energy Center in Madison, Wisconsin. The exact details of this event are usually kept top secret to make it as challenging for the competing athletes as possible, however, as more information becomes available, updates will be posted on the CrossFit Games website. Tune in from at the beginning of August to see athletes such as Patrick Vellner, Matt Fraser, Katrin Tanja Davidsdottir, and Cassidy Lance-McWherter tackle some of the most grueling tests of fitness. The top individual athletes (men and women) will walk away with a whopping $300,000 in prize money. Can I watch the CrossFit Games with a free VPN? Free VPNs may seem appealing but we strongly suggest you avoid them. A large number of users connected to free VPN servers usually means slow connection speeds. This does not lend well to streaming anything, let alone HD content. Free VPNs also tend to use practices such as selling users’ data and running intrusive ads to make money. Privacy is usually not a priority with these services. In the worst case scenario, some free VPNs are even infected with malware. You should, therefore, be quite careful about using these services. Many of them didn’t even encrypt user connections and there have been reported cases of PC-based VPNs selling user bandwidth for use as part of a botnet. All of that being a concern, one of the main reasons to avoid a free VPN is data caps. Many free VPNs put a cap on how much data you can stream, making it almost impossible to effectively watch HD live streams or any video live streams for very long before you’re completely kicked off the VPN server. While you can watch the games without connecting to a VPN, there are still advantages to using one. Some Internet Service Providers (ISPs) have been known to deliberately slow down the connection speeds of users who regularly stream media. Will the games be broadcast anywhere other than CBS Sports? CBS Sports will be the only network broadcasting the games. According to CBS, you can watch live on the CBS Sports website, via the cable TV channel, or through the CBS Sports app (which can be downloaded for mobile and streaming boxes such as the Amazon Fire TV, Apple TV, and Roku). There will also be some live coverage available through Facebook. This can be viewed online or via one of the Facebook video apps available for various devices. 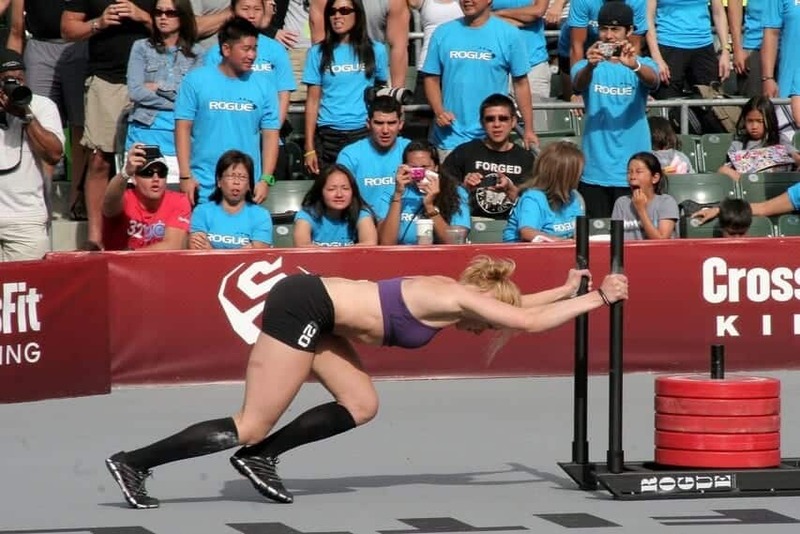 Will the CrossFit Games be broadcast in other languages? So far CBS will be the only entity broadcasting the games, so broadcasts will be limited to English. Can the CrossFit Games be streamed on mobile devices? Yes. The CBS Sports app will be showing the games as well and it is available on Android and iOS. You can alternatively access the CBS Sports website via a mobile device. If you are outside of the US, simply download the corresponding app for your VPN onto your device. Disclaimer: Comparitech does not condone or encourage any copyright violation, including streaming video from pirated sources. Although VPNs can skirt geographical restrictions and mask the user’s identity, please consider the local laws, victims, and risks of piracy before downloading or streaming copyrighted material without permission. Image credit: “Annie Thorisdottir Pushing the Sled” by Anthony Topper licensed under CC BY 2.0.